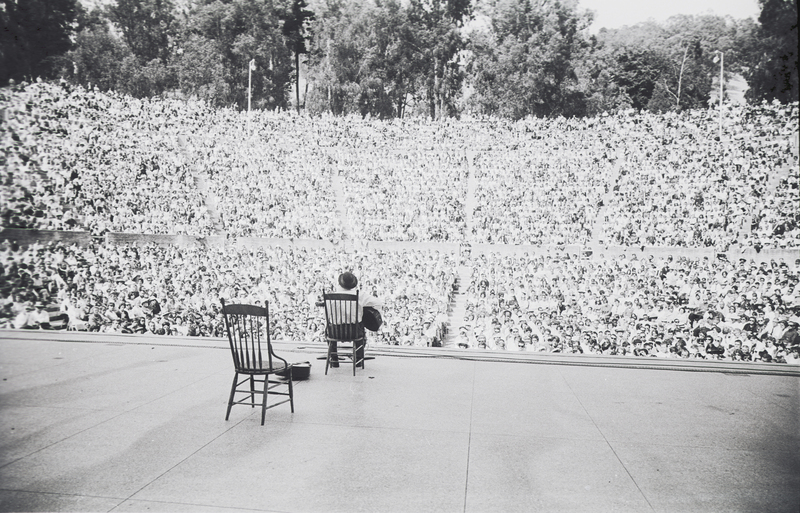 The Berkeley Folk Music Festival ran annually from 1958 to 1970 on the campus of the University of California, Berkeley. Its archive, containing over 35,000 artifacts (papers, business records, recordings, posters, ephemera, and over 10,000 photographs), has sat virtually unused in Northwestern University’s Special Collections Library since the materials were purchased in 1974 from festival director Barry Olivier. The Berkeley event offers access to the understudied history of the folk revival on the West Coast. It preceded the more famous Newport Folk Festival in Rhode Island, and in fact provided a direct model for it by featuring many prominent musicians of the post-World War II folk revival in a mix of concerts, workshops, and collective music-making events. This project preserves the collection digitally and provides access to its rich holdings for research as well as in a curated online exhibition, a gallery exhibition, events and programming, and a print catalogue. The Berkeley project also connect the archival richness of the collection to other archival holdings to demonstrate how the folk music revival on the West Coast presents a different story than the one more typically told based on a focus on the East Coast and South. 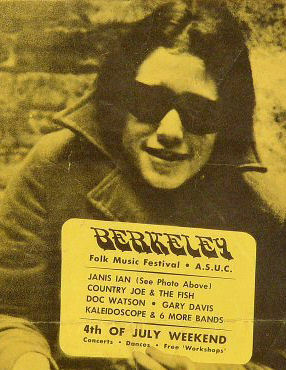 The Berkeley Folk Music Festival, which took place annually on the flagship campus of the University of California between 1958-1970, was directed by Barry Olivier, a Berkeley-raised guitarist and folk music advocate. The Festival was one of the preeminent folk festivals on the West Coast, predating the more famous Newport Folk Festival on the East Coast and partly inspiring its workshop model as well as its mix of older and newer, more vernacular and more commercial, performers. 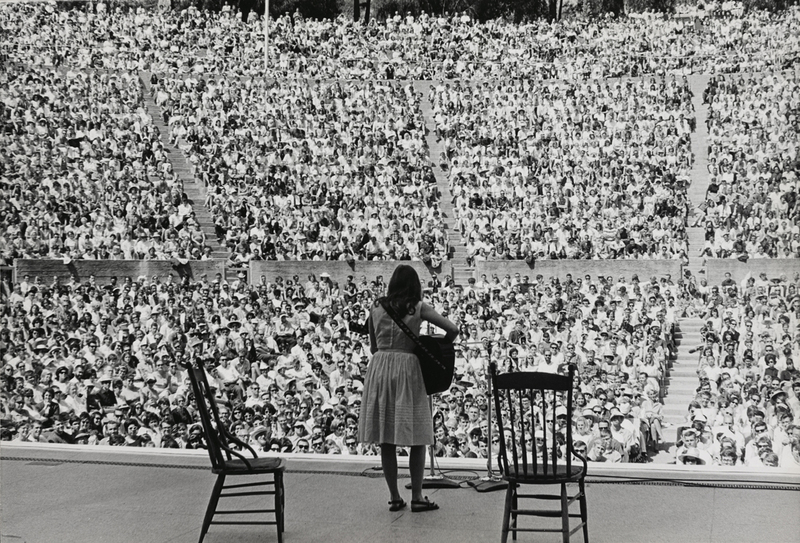 Among others who appeared at the Berkeley Folk Music Festival were Joan Baez, Pete Seeger, Doc Watson, Alan Lomax, Howlin’ Wolf, Phil Ochs, Alice Stuart, Jean Ritchie, Jean Redpath, Jesse Fuller, Big Mama Thornton, Mance Lipscomb, Mississippi John Hurt, Slim Critchlow, Archie Green, Alan Dundes, Bess Hawes Lomax, Ewan MacColl, John Fahey, Robbie Basho, the Jefferson Airplane, the Youngbloods, and a post-Janis Joplin Big Brother and the Holding Company. The festival’s willingness to embrace electric rock music and other forms of what would become known as roots or Americana music makes it markedly different from Newport, where the infamous struggle over Bob Dylan going electric became a major story in folk revival history. The relationship of leftwing politics to the bohemianism of the folk revival was also slightly different, as was the larger milieu in which the event took place: a Northern California context of rapid postwar suburbanization, the expansion of mass higher education, and other social transformations driven by a technology-obsessed Cold War military-industrial economy. Berkeley exemplifies a diverse and adventurous musical and cultural milieu that arose on the West Coast—in the Bay Area in particular. Studying the festival more closely holds the promise of revising our understanding of the national folk revival in the decades after World War II. It reframes the relationship between cultural activity in Berkeley and New Left political events such as the Free Speech Movement and People’s Park. And it offers a fresh lens on how musical heritage has related to commerce and consumerism, state-funded cultural activity, technology and change, the existential search for authenticity, and the pursuit of a shared common life in postwar America and the world. Mississippi John Hurt performing at the Greek Amphitheater, Berkeley Folk Music Festival, 1964. The Digital Berkeley Folk Music Festival Project digitizes and preserves the archive in a way that makes its rich holdings available for a wider audience. As a mode of digital public history, it also becomes a prototype for what a digital archive can be and do—or more accurately, what digital surrogates of the original materials in the archive can enable—through online exploration and expansion. In some sense, the project seeks itself to digitally “revive” this important but understudied event from the twentieth century folk revival. This will allow scholars, educators, students, musicians, artists, and aficionados to better appreciate, analyze, and understand both the Berkeley Folk Music Festival’s historical significance and how the history of the folk revival on the West Coast continues to matter in our own contemporary times. Within the Berkeley Festival’s “digital river of song,” new ways of critically connecting the present to the past become possible. Detail of the program for the 1967 Berkeley Folk Music Festival. The Northwestern University Library and Middlebury College digital historian Michael J. Kramer and his students are working on the full preservation and documentation of the collection in both analog and digital form. Through an NEH grant, preservation efforts also examine how to model the development of a digital collection: how might we think more critically about the ways to organize and code an archive’s materials so that the individual objects are available yet also coherently contextualized within the original archive? How might we crowdsource metadata and involve students in the creation of the digital archive? What are the best platforms and methods for digital preservation as it relates to presentation of the materials? How do we grapple with intellectual property rights and issues, a topic with a long and vexed (but useful) history within the folk music revival itself? Online, can we more seamlessly and usefully bring together materials concerning the Berkeley Folk Music Festival that are in other collections? Can we also connect the archive to related collections about arts festivals, the folk revival, folk music, cultural heritage, and the historical period of the postwar era in general? Can we model ways of creating a coherent archive that is also participates in the linked open source data movement? Our belief is that digital, print, and face-to-face modes of interpretation and publication complement each other. 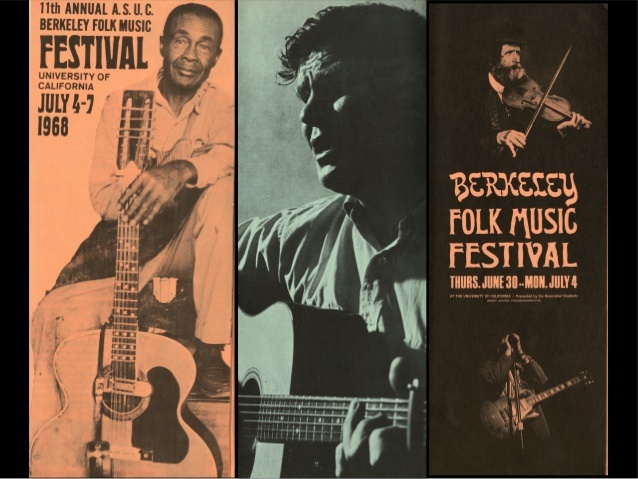 Because the Berkeley Folk Music Festival contains such rich photographic documentation, one print-based project arising from the research is a catalogue (linked to a traveling exhibition, see below) that tells the history of the festival. The catalogue will feature contributions from festival participants and performers as well as scholars. Michael Kramer is also at work on a monograph, titled This Machine Kills Fascists: Technology and Tradition in the US Folk Music Movement. The book probes the relationship between cultural heritage, memory, machines, and modernity in the folk revival movement. It focuses on figures such as Woody Guthrie, who famously wrote “This machine kills fascists” on his acoustic guitar during World War II; folklorist Alan Lomax, who computationally studied global folk song style, beginning in the 1960s; ethnomusicologist Charles Seeger, who sought to create a “melograph,” an electronic notation machine for non-Western music; early ballad collectors who debated what amounted to information systems for organizing and communicating their findings; Zora Neale Hurston, who not only created a new form of audio field recording, but also pioneered the use of film for ethnographic research; Harry Smith, who wanted his influential Folkways Records Anthology of American Folk Music to function like a computer making surprising musicological connections across songs; the technological imagination of Afrofuturist musicians such as Sun Ra and the members of Parliament-Funkadelic, who are not typically included in the folk revival, but have connections to its mediations of memory and heritage; and finally, more recent nostalgic recoveries of antiquated technologies such as recording to 78 r.p.m. as well as the vibrant life of folk revival activities over online communication systems such as YouTube. 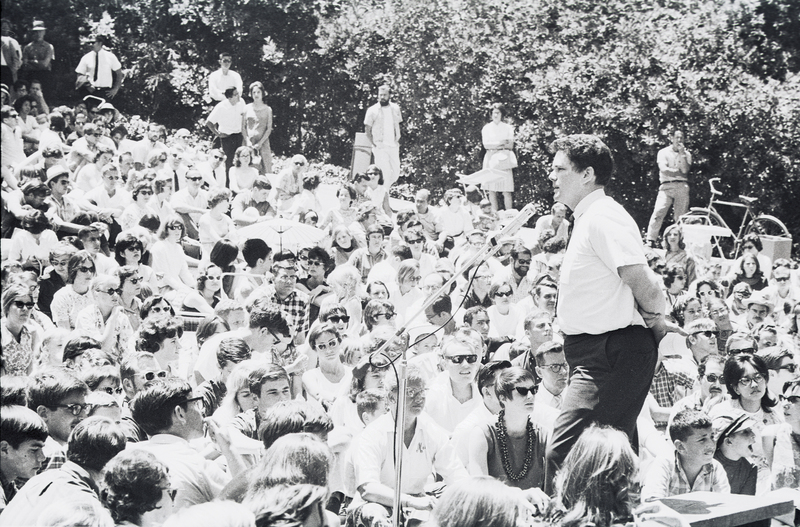 Barry Olivier, festival director, at the Faculty Glade, Berkeley Folk Music Festival, University of California, 1964. What would it mean to extend the Berkeley Folk Music Festival into the digital realm in creative and engaging ways? How do we carry forward the transmission, adaptation, and inspiration of cultural heritage in ways that are productively pleasurable and critically aware at the same time? How might we digitally expand what Pete Seeger and others have famously called the “folk process,” the passing along and reworking of songs to both remember the past and speak to the present and future? Might we even be able to draw upon the kind of learning that took place at the folk music workshops pioneered at the Berkeley Festival? In response to these questions, we are developing a “workshop” software platform using the Berkeley archive. It will allow scholars, educators, musicians, aficionados, and the general public to explore the Berkeley Folk Music Festival collection and be a space in which participants not only can access objects, but also can “play” with them digitally. Consisting of a layered map of the Berkeley Festival year by year along with other modes of virtually “attending” the festival, the website seeks to be more than a flat presentation of the past. Rather, it will harness the virtuality of the digital to allow users to “touch” the materials in the Berkeley collection (and potentially other linked digital repository collections as well) in ways they could never do so with the actual originals. This kind of digital archive has the potential to model how to bring archival objects into connection with their analysis in more dynamic and connected ways. Preservation feeds into analysis and interpretation through the ability to pivot in one space between, on the one hand, archival objects and, on the other, tools of multimodal experimentation, including visualization, sonification, algorithmic analysis, annotation, assemblage, horizontal and vertical narrative techniques, topic modeling, intensified collaboration among multiple users, and multimedia presentation capabilities. Users can rearrange items, collage them, compare multiple objects, layer annotations upon materials, view annotations by others, add comments, and contribute their perspectives to the archive. Their contributions themselves then become new objects in the collection. The traditional archive, static and removed from circulation, still serves the purpose of preservation here, but it also becomes interactive, a space where memory and the past come alive in the present, and where the present itself flows or feeds back into the past in new ways. Previously concealed in the library stacks, the original repository now has a chance to come to life in a new form through digital technology. It can carry onward the best aspects of the Berkeley Folk Music Festival while also allowing for a space of critique, expansion, and even transformation. In this imagining of what the digital archive can be and do, it potentially enables the valuable project of actively and critically passing along cultural heritage, enhancing experiences of art and music, and empowering scholars, educators, students, musicians, artists, and the general public to engage in deep, direct, meaningful historical learning. The original Berkeley Folk Music Festival privileged face-to-face interactions. To extend this legacy and continue to investigate it, we will curate a traveling exhibition about the Berkeley Folk Music Festival. This exhibition will include poster art, photographs, sound installations, film footage, and a program of concerts, talks, roundtables, and (of course) hootenannies. Berkeley Folk Music Festival program covers. We are undertaking an extensive oral history project with performers and attendees at the festival to expand the collection. In the past few years, director Barry Olivier, performer Alice Stuart, and Berkeley native, banjoist, and folklorist Neil Rosenberg (along with his partner Terri Rosenberg) have visited Northwestern for public conversations and concerts, met with students in Michael Kramer’s digital humanities research seminar when he was a visiting professor at Northwestern, and participated in oral history interviews in the archives. These oral histories that emerge from engagements with archival materials offer a particularly useful new avenue for understanding the festival’s significance. 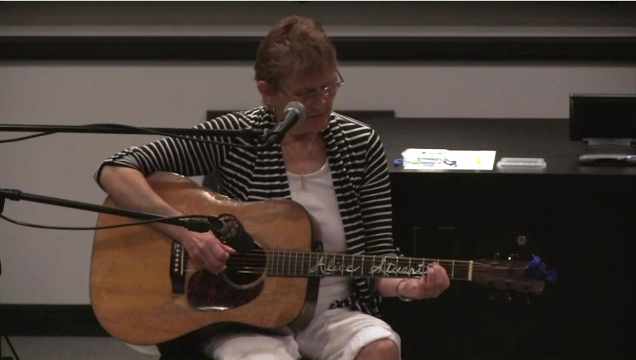 For example, we now have a performance by Alice Stuart of “Rather Be the Devil” from the 1968 Berkeley Folk Music Festival and from her appearance at Northwestern in 2012. 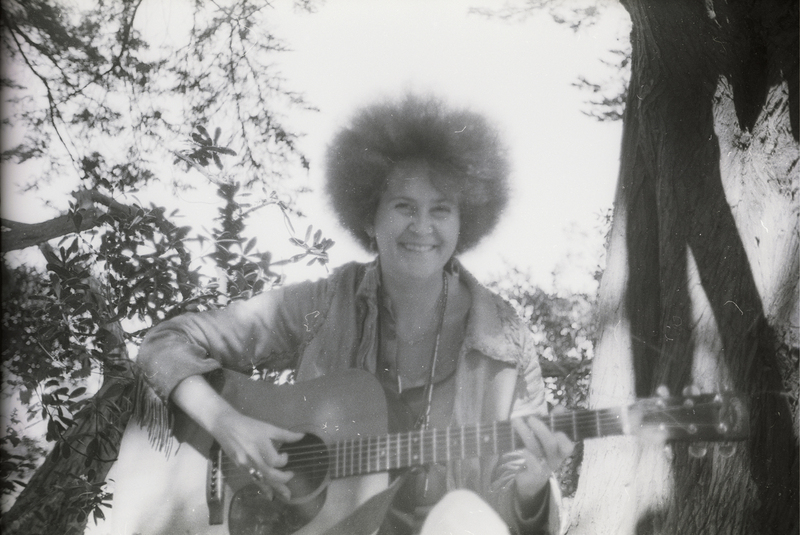 Alice Stuart at the Berkeley Folk Music Festival, 1964 and 1968; performing at Northwestern University, 2012. Working with Middlebury College’s Center for Civic Engagement, Digital Liberal Arts Initiative, the Blue Bear School of Music in San Francisco, and the San Francisco Field Study Group of Northwestern University’s Center for Civic Engagement, we are developing a music and technology program for students. Students at Middlebury and Northwestern will be able to travel to the Bay Area to study the history of music and community in the region. We are developing connections with educators at the primary and secondary levels as well to link contemporary music technologies of production (such as Apple’s GarageBand) to folk traditions and practices. These programs offers students the opportunity to acquire digital skills, literacies, and competencies alongside musical and historical knowledge. They also build community and civic life through historically-conscious artistic and technological engagements.